Oh the French… they have some of the most wonderful sauces I have ever tasted, and yet they’re often quite complicated to make. Hollandaise sauce is among my favorites, but my schedule and lack of patience had me turning to the grocery store packet mix when I have a craving for eggs Benedict. I hated that! I needed to create a simple Hollandaise sauce recipe. Each spring when the asparagus in the garden starts to emerge, and the chickens are laying eggs in abundance, I crave the from scratch version. With my handy food processor (or a blender) I’ve come to a better, quicker solution, a simple Hollandaise sauce. So, no more powdered packets for us! 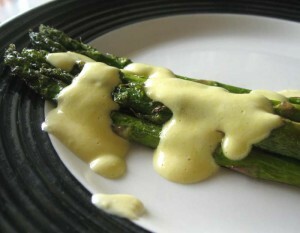 It’s so easy, and tastes exactly like the classic sauce to a T. Here’s my recipe for Simple Hollandaise Sauce. Add your yolks, mustard, lemon juice and pepper right into the blender or food processor container. Pulse on high for 5-10 seconds. Then with a slow steady stream, pour in the still-hot butter until completely combined. If your sauce is a little thick for your taste, whisk in a tablespoon of warm water to thin it out. That’s all there is to it! Serve your simple Hollandaise sauce immediately or keep it warm in a double boiler until ready to serve. According to Julia Child, “Sauces are the splendor and the glory of French cooking.” I agree! Do you have a favorite sauce you use your spring abundance of eggs to make? If not, what do you like to do with eggs when you’re overrun? How does this differ from “classic” Hollandais? This is how I was taught to make it. I freeze my extra eggs, & use them in baking or quiches when egg production is low. 3 -6 fit nicely in a small plastic tub like from a deli. I tend to freeze the amounts I need for certain holiday recipes. I put a small folded piece of waxed paper ontop before putting the lid on to keep any excess air off the eggs. Everything tastes as good as ever.